I've been working a lot with assemblers recently, just love the way how they work. So, I decided to write a MIPS Assembler myself and put in some cool features, such like upper and lower half recognition, variables/defines, etc. 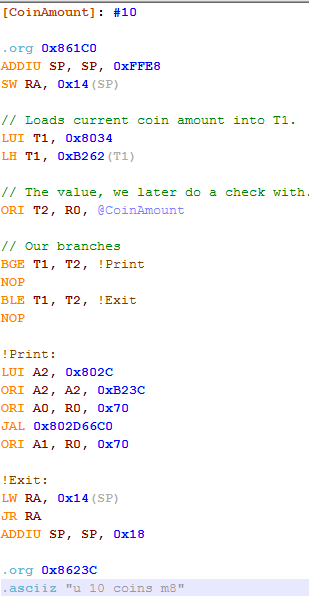 Basically this is a MIPS Assembler which I made for another community which still profits from it. It supports all MIPS III opcodes, supports pseudo-instructions (BGT (Greater Than), BLT (Lesser Than), BGE (Greater or Equal To), BLE (Less or Equal To, and a few more). [VarName]: #/%/0x/$value // Sets a define/variable and can be used in any immediate instruction calling for values. .org tells the assembler where to place the code. .ascii/.asciiz puts ascii string (.asciiz is zero-terminated, basically puts a 00 byte at the end of the string) into file. I post some other progress here too soon, if anyone is interested. Assemblers can be fun. Hello, dear community. This introduction comes a bit late and I realized it just now and wanted to catch up on this. First off, I'm 16 years old and work with hermetics, psionics, kabbalah and all this stuff. I'm pretty dynamic and diversified in this, because of hermetics. Hermetics basically is not 'one' subject, but involves all other subjects too, which later made me understand why hermetics is also called an universal teaching. I always explain my psionic phenomena by hermetics (after Franz Bardon). I like Bardons metaphysical system and it basically explains me any kind of phenomena I have ever occured(may it be from physical, mental or astral nature), which even surprised myself. This universal key is therefore my main paradigm, my main philosophy of the world and anything. I'm currently starting with hermetics, but learned the theory part pretty good, but the practical part is more important at the end. In psionics, I've been doing complex constructs, later explained the phenomena by hermetics (bardons metaphysical system) such like the psi-ball and shell. Basically, the expanding and warm feeling psi-ball between my hands is actually the projection of the electric fluid and the shell is the exact opposite, it's magnetic fluid, contractive and feels cold. If I now surround the contracting shell around the expanding psi-ball and the dose of the shell is about equal to the expansion force of the psi-ball, the psi-ball with the shell begins slightly to vibrate and is now a kind of electromagnetic fluid. First off, before some misunderstand, the terms "electric", "magnetic" and "fluid" do NOT refer to electricity and magnetism or fluids in physics. Basically, the physical phenomena of electricity and magnetism are only analogue(not equal) to the philosophical principles (electric and magnetic fluid). I've been searching for a very long time for a community, which is serious about psionics, magick and (if we talk about the specific magick paradigm, only a less amount use) hermetics. When I was around 8 or 9, these kind of topics interested me already and I found the community called PsiPog. In that time, I wasn't really able to speak good english because english isn't my mother tongue + I was still too young to explain these kind of things in clear and detailled words. Only a short time later, PsiPog closed and disappeared. While then I studied myself and bought books and read them. Then I tried searching again for communities as I had very specific, theoretical questions which books couldn't answer me that easily. I found then PsiWikia, but short time later I had to realize that this community is so full of half-truths and charlatans that I never decided to stay there. Only short time later, I discovered myTK which was quite good but somehow it also missed certain points. Later myTK turned into PsiWarriors. PsiWarriors is even more horrible than any other community I've joined yet. Every user literally 'bragged' how cool they were with their abilities or were posting psi instructions which are completely impossible to practise in reality (because most of these fake instructions are taken out from popular animes and mangas such like Naruto, Bleach and DBZ) and even again completely missed the point of what psionics really is. I truly have to say, the first time I saw PsiWarriors, I thought they were a kind of roleplaying community. But they actually take their own words serious. This also led me leaving PsiWarriors. At the end, I found this community here, Vsociety. To my surprise, this community is really good, far better than the most ones I've seen yet. I'm not overreacting, I'm saying this from heart as the most communities have disappointed me. So, I decided to stay here as this community provides really good information, I've read the articles and I'm surprised how many wise people we have here. I hope we all will have fun here.